Everything Chopsticks has a new line of whimsical character chopsticks guaranteed to bring a smile to fellow diners' faces. There are nine styles in all including a Ninja Girl, Sushi Chef (Itamae) and Sumo Champion Wrestler and all are just $3.95 a pair. Each style of chopstick features a solid body color with a whimsical character design at the end of the handle. The Ninja is of course all black with his little face peeking out, shown with his sword and throwing stars. The Judo Black Belt chopstick is gloss white "gi" with black belt and disciplined clean haircut. The Salaryman chopstick epitomizes the Japanese corporate employee, with his blue suit, briefcase and rosy red cheeks from having one-too-many at the end of the workday. The Sushi Chef (called Itamae) chopsticks have the man with his sushi knife in one hand and a fish in the other. The pink Ninja Girl shows with her knife, throwing star and hair in a tidy pony tail. There is also a Geisha Apprentice in a bright red kimono with her made up face and black obi sash. The flesh colored Sumo Wrestler Champion (Rikishi) has his loincloth (mawashi) and intimidating face. The Ronin lone warrior is dressed in his gray and blue coat brandishing his samurai sword, and the Rebel Biker takes on a James Dean look while straddling his motorbike. 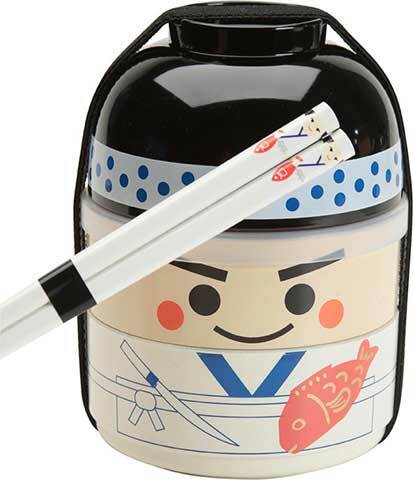 There are even matching bento (lunch boxes) perfectly mated for the Ninja and Sushi Chef chopsticks. Each bento features two bowls, a lid, a cup or third bowl and elastic band to hold the unit together. 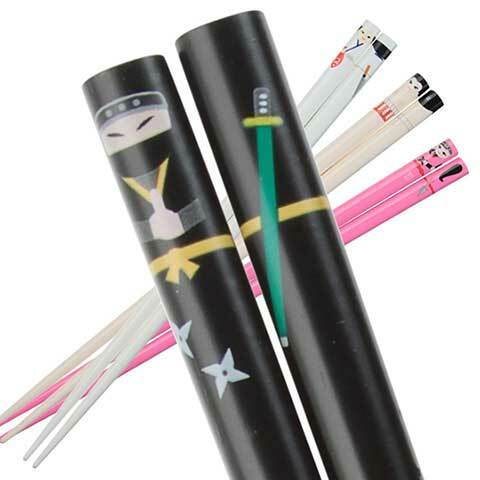 You can see the fun character chopsticks now at EverythingChopsticks.com.